The Lyme Bay coastline has been a part of Dr Adam Rees’ life since he was a child. Growing up, family trips to the seaside were spent on the beaches and in the small communities that line its shores. It goes without saying, therefore, that his research looking at ways to conserve it for the future, while protecting the livelihood of its small fishermen, is something very close to his heart. After completing his A levels, Adam came to the University of Plymouth in 2008 to study Marine Biology. Towards the end of his first year, he enquired about the possibility of getting involved with research over the summer and was pointed in the direction of the Lyme Bay Project. At the time, it was still very much in its infancy. But almost a decade later has become a national beacon of how science and the community can combine. It was also featured in the 25-year Environment Plan, the Government’s long-term vision for protecting the environment for future generations. The project involves going out with the fishermen and deploying underwater cameras, which are then used to assess the abundance and diversity of different species and plants living on the seabed. 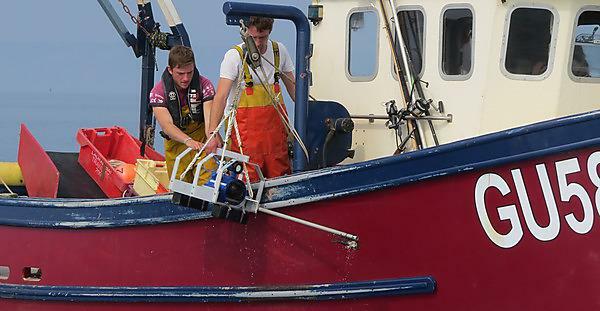 For his dissertation, Adam analysed a year of this footage, and that – and his subsequent work as a Research Assistant – has helped build a picture of changes in the marine environment caused by a combination of fishing practices and conservation measures. He has also worked closely with fishermen in the community, and says winning them over was in many cases more challenging than the scientific elements of the project.